← What’s In The Pantry? Chocolate-Dipped Cookie Dough Bites (gluten-free, dairy-free, vegan, grain-free, and sweetened with whole dates). As you may know, I have a sweet tooth, a deep and abiding love for sweets that has been a beast to tame in the transition from my former I-exercise-so-I-can-eat-whatever-I-want mentality to a more balanced lifestyle that focuses on nutrient-dense food to fuel my health for the long term. My tastebuds have shifted dramatically over the past year and a half, and treats I used to enjoy now often taste off-putting in their cloying sweetness. However, I’m still nostalgic for that particular little ping of pleasure that a well-deserved treat at the end of the day inspires. So, lately I have been turning to these little gems: cookie dough bites that taste oh-so-decadent, but are packed with nutrients, protein, and fiber. Unless you spill the beans (garbanzo, that is…), no one will ever guess these treats are gluten-free, dairy-free, vegan, and low in added sugar. They’re sweetened entirely with whole dates (see Pantry Staples to learn why), and can even be made grain free! Gluten-free oat flour will give the cookie dough a smooth, creamy texture, and is actually much easier to digest uncooked than wheat flour. For a grain-free alternative, use coconut flour. Since coconut flour absorbs more liquid than oat flour, the texture of the cookie dough will be a little bit stiffer and less smooth, but the Gent actually prefers it that way (while I prefer the oat flour). If grains are not an allergen concern, then you can also split the difference and use half of each. 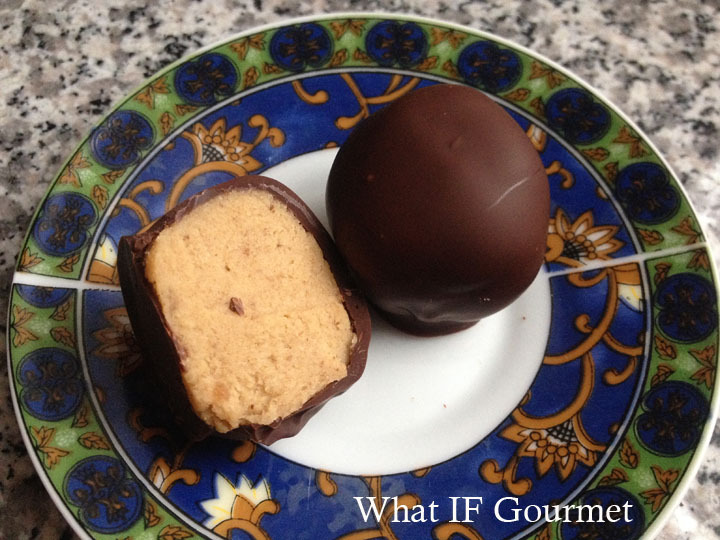 You can also make these with vegan buttery spread for a more “buttery” flavor, but I prefer the creamy mouthfeel when this recipe is made with coconut oil instead. Both the texture and flavor will be better the day after you make these, once the flour has had time to fully soften and the vanilla really permeates the dough. I think they taste best chilled rather than at room temperature. The combination of fiber-rich dates and protein-packed chickpeas means you will feel pretty darn satisfied after a recommended serving of just two cookie dough bites. I like to savor them slowly, instead of wolfing them down all at once. Sometimes it’s our brains that need the treat more than our bellies, and taking the time to slow down and savor the moment is what I actually need to feel satisfied. So go ahead, let go of the guilt and satisfy that sweet tooth with these chocolate-dipped cookie dough bites! Fold 1/4 cup mini chocolate chips into the dough after forming. 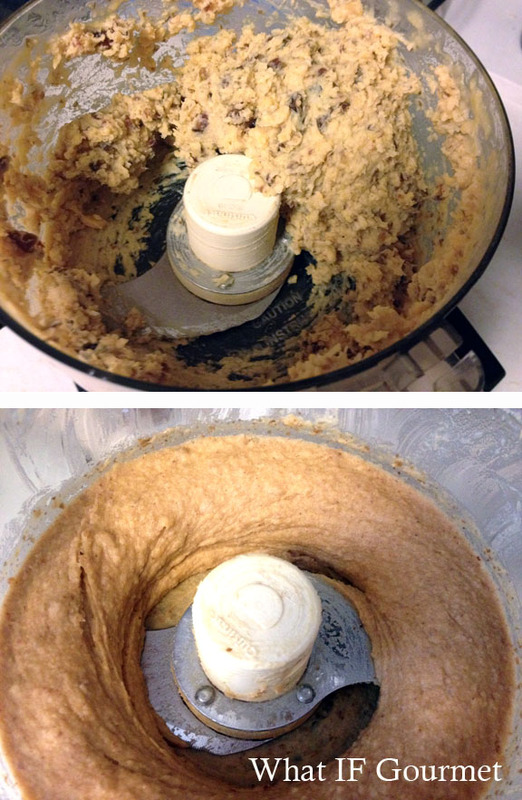 Blend first four ingredients in food processor and puree until smooth. This should take about 3 to 4 minutes, stopping to scrape down the sides of the processor bowl after every minute of pureeing. When the chickpea-date mixture is smooth and uniform, add salt and flour and process just until combined. Above: after 1 minute of pureeing. Below: after 4 minutes of pureeing. Dollop 1 Tbsp of dough onto a cookie sheet lined with wax paper or parchment paper. It will look jagged and messy, and that’s o.k. for now. Repeat until all of the dough has been used. (Makes about 18 to 20 bites, depending on size.) Put cookie sheet in freezer for 10 minutes to firm and chill the dough. Roll each dollop of chilled dough lightly between palms until it forms a smooth ball. Put the cookie sheet back in the freezer while you melt the chocolate for the coating. 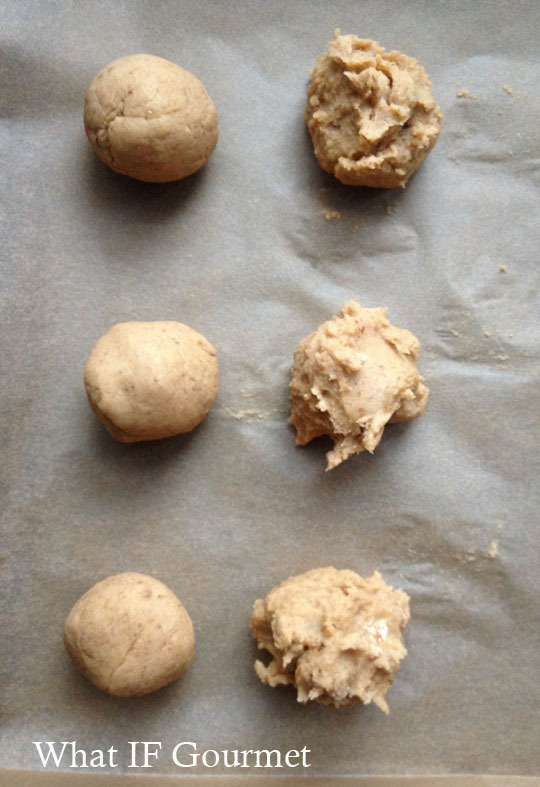 Just-blended dollops of dough on the right; dough balls after chilling and rolling on the left. Melt the chocolate chips and grapeseed oil in a small glass bowl in 30-second increments on HIGH, stir, then heat for another 30 seconds. Stir chocolate for a full 60 seconds before determining if it needs another 15 to 30 seconds of heating. Use as little heat as possible to thoroughly melt all the chocolate. 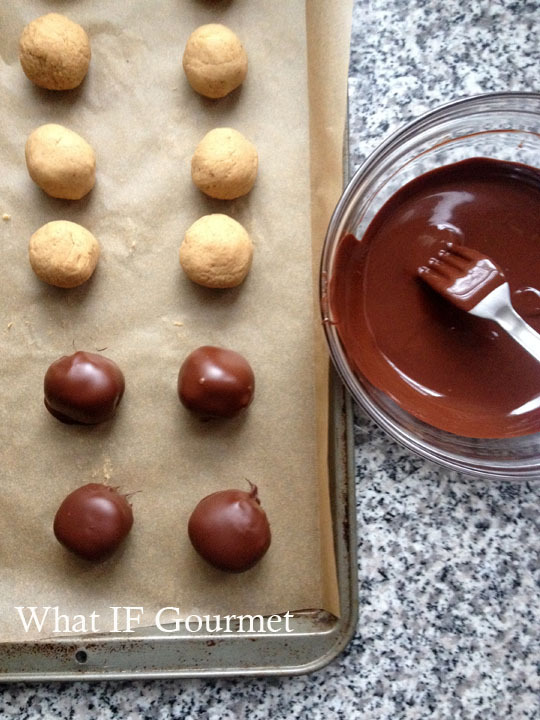 Drop a ball of chilled dough into the bowl of chocolate and quickly turn to coat. Lift out with a fork and place it back on the same parchment paper lined cookie sheet. Repeat until all cookie dough balls are coated with chocolate. Refrigerate until firm, and then move to an airtight container and store in the refrigerator. *For a unique flavor with a hint of molasses and a hint of smoke, substitute up to half of the flour with mesquite powder, the dried and ground pods of the mesquite tree. Yum! 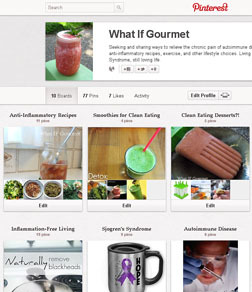 This entry was posted in Anti-Inflammatory Ingredients, coconut oil (virgin/ unrefined), Dairy-free, dark chocolate (70% cocoa or more), Desserts, fruit, Gluten-free, legumes, Nut-free, Recipes, Snacks, Vegan, Vegetarian. Bookmark the permalink. I am immediately making these when I get home!! I wonder if you add some natural peanut butter to this you could get close to a buckeye? May have to try that after Lent is over.